If you’re learning how to make a website, I can almost promise you that as part of that quest, you’re going to become very intimate with a tool called cPanel. That’s because most hosting providers, especially those on the more affordable end of things, use cPanel to help you manage your web server. But as widespread as it is, cPanel is…well…let’s just say that it’s not always very beginner friendly. Especially if you’ve never built a website before. As a result, you might be struggling to understand how to make your way around cPanel, as well as how to take advantage of all of the functionality that cPanel offers. If that sounds like you, you’re the person who’s going to benefit from this guide. I wrote this guide for beginners. That means I’m going to kick the technical jargon to the side and speak to you like a person. There’s a ton to cover, so let’s get started! 1. 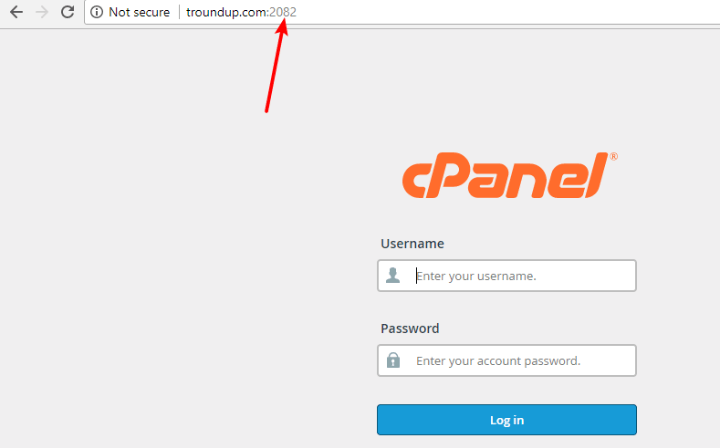 What Is cPanel? What Does It Help You Do? cPanel is the control panel for your web hosting. It gives you a graphical interface to help you perform tasks that would otherwise require you to know about programming. Essentially, it makes your web server “human friendly”. That’s a good thing because otherwise, you’d need to be like one of those hackers in the movies! What Does cPanel Help You Do? As you move through this cPanel guide, you’ll learn exactly how you can perform each of those functions. If you don’t see a welcome email that specifically references cPanel, you can usually also access cPanel by logging into your host’s customer area and clicking a link inside that area. From there, you’ll still need to enter your username and password, though. If you don’t know these details (and didn’t receive them in a welcome email), your best option is probably to contact your host’s support. There’s no single cPanel interface design. Instead, the actual design that you’ll see is up to your host. For that reason – your cPanel might not look exactly like the one I’m going to show you in this guide. 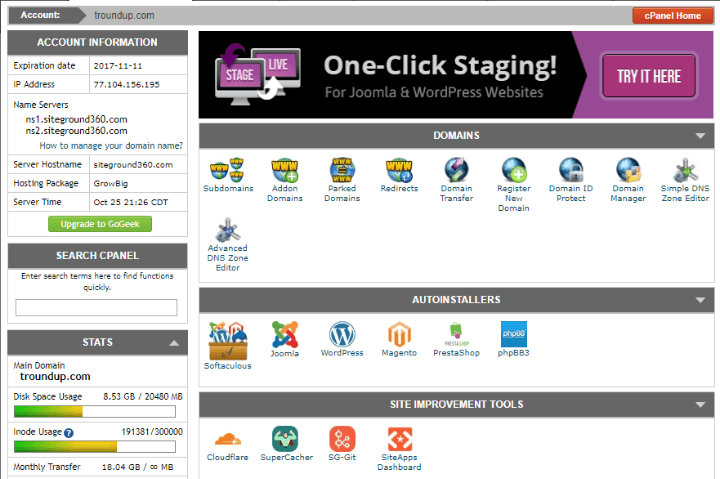 These options are where the meat of cPanel’s functionality lies and should be similar across all hosts. I’ll be using the older X3 theme for the remainder of this guide because it’s what SiteGround, a popular WordPress host, uses. But even if your host has the newer Paper Lantern theme, you should have no problem following along. 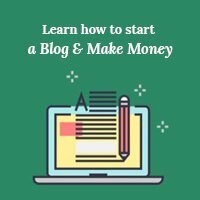 After signing up for hosting, one of the first things you’ll likely want to do is install WordPress or another content management system to actually start building your site. To help you do this, cPanel usually includes tools called Autoinstallers that offer a user friendly method for installing popular software packages. 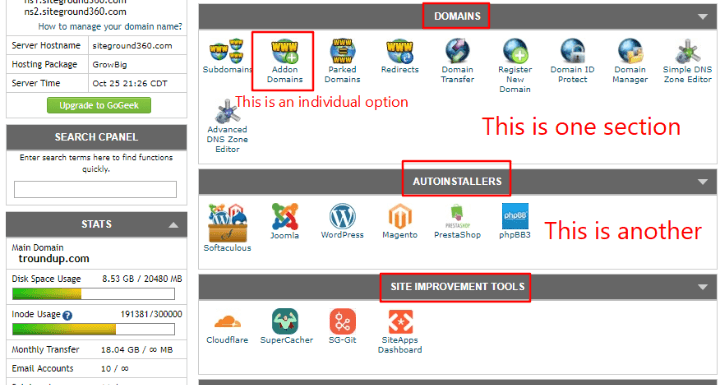 You can see these different autoinstallers laid out in the Autoinstallers section of my example cPanel dashboard. Then, follow the beginner-friendly install wizard to install the program on your site. Because some hosts use different Autoinstaller software, it’s hard to give a specific tutorial for the rest of the process. If you need more help, though, WPKube has actually published a post on how to use each individual Autoinstaller to install WordPress. When you signed up for your hosting account, you should’ve configured at least one domain during the signup process. This will always be your primary domain. For the purposes of the examples below, let’s say your primary domain is “designbombs.com”. Subdomains – these are an addition to your primary domain name. For example, something like “mysite.designbombs.com”. Both of these options (and more!) are located in the Domains section. Enter your domain name in the New Domain Name box. Once you do that, cPanel should pre-fill two of the other boxes. Then, all you need to do is enter your desired password and click Add Domain. As with Addon Domains, you can also use this section to manage any of your existing subdomains. File Manager – this tool lets you directly upload files via your web browser. 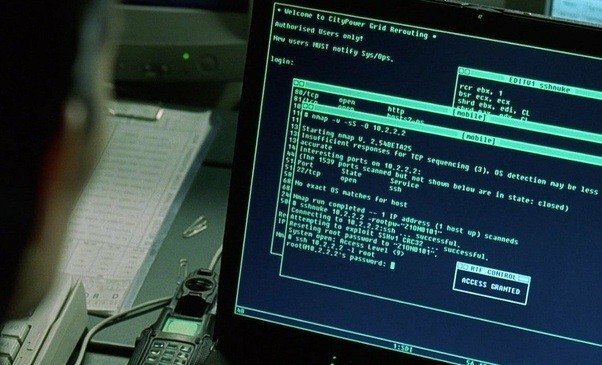 FTP Accounts – these let you connect to your web server using something called an FTP program. File Manager is nice because it’s convenient and doesn’t require any third-party programs (remember – it works right in your web browser). But if you need to upload a large number of files (like a whole album of images), File Manager isn’t really the most effective method – you’ll be better off using FTP. I’ll show you how to use both. Then, you’ll be taken to the File Manager interface. cPanel only helps you with the account credentials part – you’ll need to download your own FTP program (I recommend FileZilla). Login – enter your username in this box. Password – enter the password you’ll use to connect via FTP – make sure it’s secure because FTP is powerful. 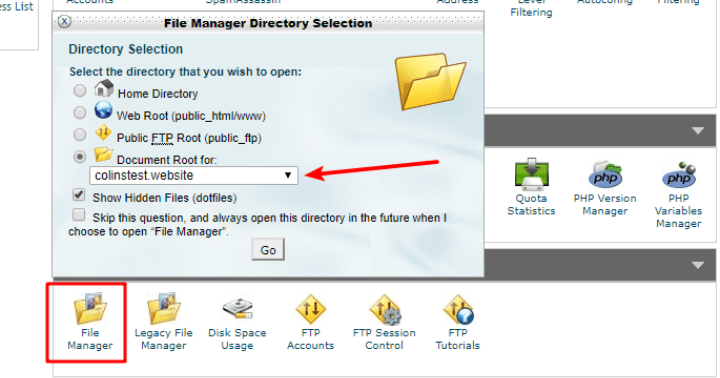 Directory – leave this blank if you want to be able to access all folders. If you want, though, you can use it to restrict FTP access to only specific directories on your server. Quota – leave this unlimited unless you want to set an arbitrary limit on how many MB this account can upload. Once you create your account, use those credentials to log in to your FTP program of choice. One of the neat things about owning a website is that you can create your own email account using your domain name, instead of needing to rely on something like Gmail. That is, you can be “james@yoursite.com” instead of “james@gmail.com”. To start using your own email address, though, you’ll need to first get everything set up in cPanel. Email – this is the part of your email address that comes before the “@” sign. Mailbox Quota – this is how much server space you want to allocate to your email address. Once you create your email account, you can use Webmail to start sending and receiving emails right away. To access your webmail, all you need to do is append “/webmail” to your domain name. You can also set up your new email address to work with something like Google Apps or Outlook, but that falls a bit outside the purview of this guide. If you need help, SiteGround has a good series of tutorials for different email programs. Password Protect Directories – this lets you add a password to certain folders on your server. 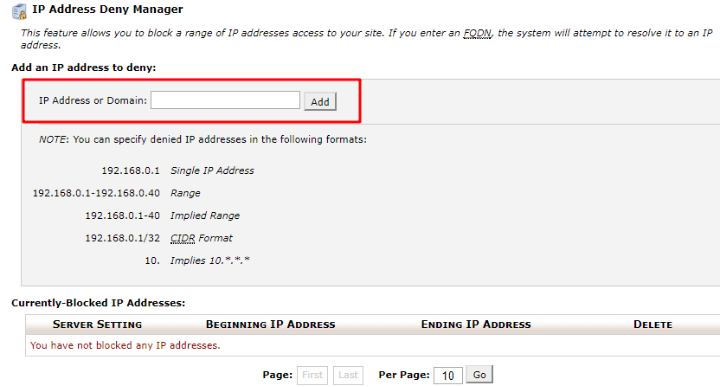 IP Address Deny Manager – this allows you to block traffic from a specific IP address that might be causing you trouble. Databases are tools that help you store and access data. If you’re using a tool like WordPress, all of your website’s data is stored in a database. Most of the time, you’ll never need to think about your database. But it does come in handy to know how to manually create a database if you ever need to, say, migrate your WordPress site manually. Then, you’ll need to complete a 3-step process. As I said, you’re unlikely to need to use this functionality on a daily basis. But in certain situations like site migrations, it is definitely handy to know how to create a database in cPanel. Like databases, error logs are a niche feature that you’re unlikely to regularly come in contact with. But if you’re running into issues with your website, your server’s error logs are an invaluable tool in helping you (or your developer!) diagnose what’s happening. And that wraps up my massive cPanel guide! 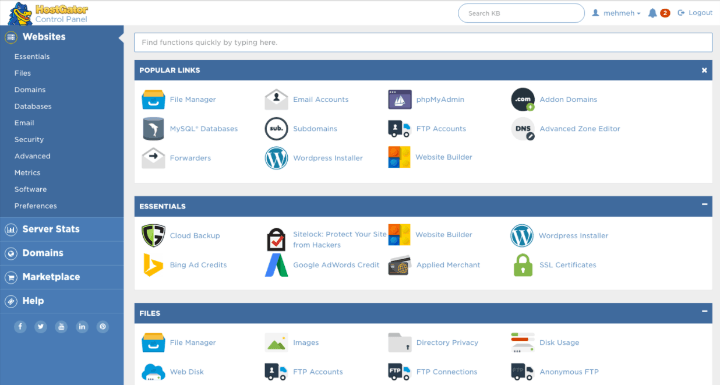 If you’re using shared hosting, I can pretty much guarantee that your host uses cPanel, which is why it’s so vital that you understand how to navigate your way around the cPanel dashboard. At this point, I hope you have the skills to do everything you need! If not, you can always leave a comment and we’ll help you get things sorted.